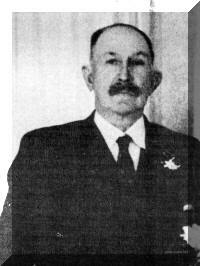 3-William Robert Appleby was born on 2 Apr 1882 in Exton, Tasmania and died on 5 Feb 1964 in Penguin at age 81. William married Geraldine Turnbull about 1900 in Ulverstone, Tasmania. Geraldine, known as Birdie, was born on 12 Oct 1883 in Ulverstone, Tasmania and died on 26 Jun 1908 in Ulverstone, Tasmania at age 24. William was born at Exton. At the age of four he went with the family to live at Chudleigh. Later they moved to Mole Creek and then to Gawler where he finished his schooling at Ulverstone. One of William's first jobs was working in a copper mine. At the turn of the century copper was discovered by two prospectors, Lee Clarke and Aubrey Sice and it was called the "Copper King" mine. The mine employed about 300 men and copper was transported to Burnie for export. With the mining slump of 1907, the mine closed down — William then went farming at Upper Natone and was living there with his father when the 1915 bush fires swept through that area. All their valuable possessions were put down the well and were saved from being burnt. William like his father was a champion ploughman and in later years judged at the Ploughing championships. Geraldine Turnbull was born at Ulverstone on 12th October, 1883, and it was there that she met and married William Robert Appleby. Unfortunately Geraldine only lived until 1908 when she was just 25 years old. William married Phyllis Therese Bishop, living at Upper Natone for a few years then moving onto a property owned by James Alford at Stowport. William and Phyllis had two children, William and Nellie. It was while they lived there that they had a contract to supply porkers to the mining towns on the west coast. William had to slaughter and dress the pigs, then transport them by horse and dray to the Wivenhoe railway station where the Emu Bay Railway supplied a truck on the government line to collect the carcases. Tragedy again came into William's life, for after a short illness Phyllis died aged 32. Despite his setbacks, William continued his farming, leasing and then purchasing a property at Riana, this property is today (1988) owned by his grandson, Allen Appleby. William re-married in 1937 to Dorothy Smith of Penguin. 4-William Andrew Appleby was born on 6 Jul 1920. William married Hazel May Coates, daughter of Arthur Lewis Coates and Winifred Ivy Smith. Hazel was born on 14 Feb 1926 and died on 14 Nov 1973 at age 47. They had four children: Allan Arthur, Colleen Phyllis, Beverley Mavis and Shirley Vonda. 5-Allan Arthur Appleby was born on 14 Nov 1945. Allan married Carol Maree French. Carol was born on 9 Dec 1952. They had three children: Leanne Ellen, Catherine May and Stuart William. 6-Leanne Ellen Appleby was born on 4 Sep 1972. 6-Catherine May Appleby was born on 11 Mar 1975. 6-Stuart William Appleby was born on 21 Jul 1977. 5-Colleen Phyllis Appleby was born on 1 Aug 1948. Colleen married Dale Wallace Aitken. Dale was born on 27 Jul 1946 and died on 27 Feb 1984 at age 37. They had five children: Darlene, Gene, Gina, Leesa and Lisa. 6-Darlene Aitken was born on 20 Aug 1969. 6-Gene Aitken was born on 31 May 1971. 6-Gina Aitken was born on 31 May 1971. 6-Leesa Aitken was born on 10 Mar 1973. 6-Lisa Aitken was born on 10 Mar 1973. Colleen next married Henry Lucas. Henry was born on 11 Mar 1948. 5-Beverley Mavis Appleby was born on 2 Jul 1950. Beverley married Michael Rex Goodrick. Michael was born on 14 Dec 1948. They had two children: Jacqueline Andrea and Jayson Andrew. 6-Jacqueline Andrea Goodrick was born on 16 Aug 1971. 6-Jayson Andrew Goodrick was born on 22 Jul 1975. 5-Shirley Vonda Appleby was born on 30 Jul 1951. Shirley married Barry Francis Good, son of Keith Francis Good and Nancy Ada Carpenter. Barry was born on 20 Feb 1952. They had two children: Leigh and Renai. 6-Leigh Good was born on 30 Mar 1976. 6-Renai Good was born on 14 Jul 1978. William next married Gae Cooney. Gae was born on 18 Jun 1935. 4-Nellie Noreen Appleby was born on 2 Aug 1926. Nellie married Percy Sidney Rutherford. Percy was born on 28 Feb 1921. They had seven children: Gerald William, Garry Sidney, Robert Stewart, Noel James, Leon Phillip, Michael Thomas and Terisa Phyllis. 5-Gerald William Rutherford was born on 28 Feb 1947. Gerald married Jane Marshall. Jane was born on 27 Nov 1949. They had three children: Benjamin Stewart, Alexander John and James Marshall. 6-Benjamin Stewart Rutherford was born on 20 Sep 1977. 6-Alexander John Rutherford was born on 23 Jul 1979. 6-James Marshall Rutherford was born on 26 Jan 1982. 5-Garry Sidney Rutherford was born on 17 Apr 1948. Garry married Merryn McKay. Merryn was born on 4 Oct 1950. They had two children: Stuart James and Louise Rachel. 6-Stuart James Rutherford was born on 2 Oct 1980. 6-Louise Rachel Rutherford was born on 18 Feb 1984. 5-Robert Stewart Rutherford was born on 19 Sep 1953. Robert married Lorraine Butler. Lorraine was born on 6 Sep 1953. They had four children: Tanya Maree, Rachel Lee, Megan Lee and Nathan Robert. 6-Tanya Maree Rutherford was born on 3 Feb 1977. 6-Rachel Lee Rutherford was born on 28 Feb 1979 and died on 21 Mar 1979. 6-Megan Lee Rutherford was born on 5 Jul 1980. 6-Nathan Robert Rutherford was born on 26 Jan 1983. 5-Noel James Rutherford was born on 26 Dec 1954. Noel married Vicki Rose Good, daughter of Thomas Donald Good and Ruby Rose Ling. Vicki was born on 12 Nov 1957. 5-Leon Phillip Rutherford was born on 3 Aug 1956. Leon married Judi Maree O'Neil. Judi was born on 3 Jun 1955. They had three children: Adrie Laura, Sophia Mai O'neil and Ellie Kate. 6-Adrie Laura Rutherford was born on 28 Dec 1984. 6-Sophia Mai O'neil Rutherford was born on 16 Jul 1986. 6-Ellie Kate Rutherford was born in Apr 1988 and died in Apr 1988. 5-Michael Thomas Rutherford was born on 31 Jul 1962. 5-Terisa Phyllis Rutherford was born on 17 Feb 1965. 4-Henry Robert Appleby was born on 22 Jul 1937. Henry married Shirley Hall. Shirley was born about 1939. They had six children: Kathleen May, Allene Maree, Roslyn, Leonie Dawn, Judith Elizabeth and Darleen Patricia. 5-Kathleen May Appleby was born on 5 Jan 1958 in St. Marys. Kathleen married Michael John Capstick in Jan 1978 in Tasmania. Michael was born on 8 Jul 1954 in Nelson, England. They had four children: Samuel Desmond, Cameron John, Morgan Michael and Lucy May. 6-Samuel Desmond Capstick was born on 29 Jun 1979 in Queen Victoria Maternity Hospital, Launceston. 6-Cameron John Capstick was born on 8 Jul 1981 in Queen Victoria Maternity Hospital, Launceston. 6-Morgan Michael Capstick was born on 25 May 1984 in Queen Victoria Maternity Hospital, Launceston. 6-Lucy May Capstick was born on 23 Nov 1987 in Queen Victoria Maternity Hospital, Launceston. 5-Allene Maree Appleby was born on 10 May 1959. 5-Roslyn Appleby was born on 13 Oct 1960. Roslyn married Murray Izard. Murray was born on 31 Mar 1959. They had one daughter: Kylie Simone. 6-Kylie Simone Izard was born on 12 Jun 1987 and died on 10 Jun 1988. 5-Leonie Dawn Appleby was born on 24 Mar 1962. Leonie married Shaun Anthony Watts. Shaun was born on 28 Dec 1958. They had one daughter: Emma-Lee. 6-Emma-Lee Watts was born on 30 Nov 1986. 5-Judith Elizabeth Appleby was born on 12 Feb 1964. 5-Darleen Patricia Appleby was born on 28 Aug 1968.